Walt Disney's Snow White and The Seven Dwarfs. 1992. Disney Hercules - Baby Pegasus - 2 Figurines From McDonalds 1996. Condition is New. Shipped with USPS First Class Package. McDonalds Mrs Incredible Happy Meal Toy #7 With Box Incredibles 2 Disney 2018. Condition is New. Note: some distress on the plastic on the bottom left side of the front of the packaging please see pictures. Video case parade floats that hook together with character motion on rolling. 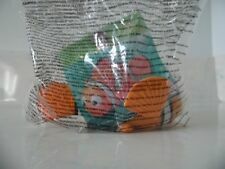 2005 Happy Meal Toy - Monsters Inc Mike Wazowsk #5 - 5" tall - NEW IN BAG! 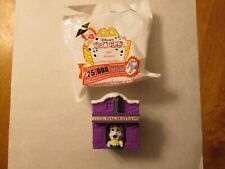 McDonalds Happy Meal 1998 Disney Mulan Toys-Factory Sealed Complete Set 1-8. Condition is New. Shipped with USPS Priority Mail. Toys have been sealed in bags and tubs for the past 15 years! See pictures for details. Most are in decent shape with a few that have a ripped tab and plastic might be a little crushed. Comes with some extra fast food toys as well as a few that don’t have boxes. If you would like more pictures of them please let me know what you would like a picture of. If you have questions, please ask! 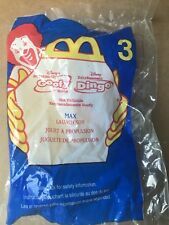 Inspector Gadget COMPLETE 1999 McDonalds Happy Meal Disney Movie Action Figure. Figured I’d used in good condition. Shipped with USPS Priority Mail. TARZAN - 1999. Toys are in very good to excellent condition. McDonald's, 2002. JOSE CARIOCA - 1943, SCROOGE MCDUCK - 1947, GUS - 1947, PRINCE CHARMING - 1950. PENQUIN - 1961, WINNIE-THE-POOH - 1966, BALOO - 1967, ELLIOTT - 1977, JAFAR - 1992. Complete in orginal packaging set of 8 and one bag which will ship folded. Sign not included. Bambi, The Three Caballeros, Sleeping Beauty, Pete's Dragon and The Lion King are from 1996. Mickey's Once Upon a Christmas and Winnie the Pooh Seasons of Giving are from 2000. We have for you today a new in the package Disney's Treasure Planet Captain Amelia McDonald's toy from 2002. This toy was number 8 in the series that year. Thank you for stopping by today, please come back by and check out all of our new listings. #4 WHISTLING DISCUS : White Frisbee that whistles when thrown. It is about 5-1/2" wide. #8 EYE OF FATES BALL: Soft white cloth "bean bag" ball printed with pink eye, about 2-1/2" tall. You get 1 of each of the following 6 Toys. Zeb Zoober. Fun plush toys! I've included a picture that shows them 'loose' as an example -. Here's what you get Ted Bedderhead. Lot McDonalds BK & other Disney Toy Story 2 Happy Meal Toys, mixed . Condition is New for 8 which include Woody Buzz Little Green Alien spinning top Lenny and army men and 6 in played with condition Woody Mr & Mrs Potato Head Slinky Dog Marionette Woody and little green alien Shipped with USPS Parcel Select Ground. 2003 McDonalds Disney PRINCESS Complete Set of 8 MINT New! Dress-up Fun & More! 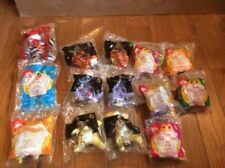 Complete set of DISNEY PRINCESS McDonald's happy meal toys from 2003 Mint in packages! All sealed! Vintage McDonald’s 1998 Happy Meal Boxes Lot Of 8 Disney Animal Kingdom Unused. Condition is New. Feel free to ask any questions about this item or any other item I have listed. If you encounter any issues please let me know and we will work hard to resolve them. I take a lot of pride in the product and the service I provide. Please always view all pictures provided of the item you wish to purchase. All items pictured will be what you receive. To help me provide better service to you, please make sure that your address is correct prior to bidding or purchasing any item. NEW 2001 2002 THE COUNTRY BEARS Complete SET of 8 Toys by McDonalds. Up for your consideration is a beautiful plush lot. Plush are pre-owned and do show signs of wear such as light pilling or fading. Just washed! Much love has been put into photographing these cute toys. Disney Masterpiece Collection ~ McDonald's 1995. Bo Peep #9. Mr./Mrs. Potato Head Windup Toy #2. The toys are in nice condition (See Pictures). I may have it and haven't listed it yet! Total of 8 pieces, includes witch, prince, Cinderella and the 7 dwarfs. All in good condition. Hold these cute little toys up to the light and look through the viewer to see a tiny scene from the ride or character it depicts! Like a View-Master, but only one picture to see. I've included a combined photo so you can see what view each toy shows inside. #7 Vanellope. Ralph Breaks The Internet. Pirates of the Caribbean Treasure Chests. "Disney"- McDonald's Happy Meal Toys/Complete Set of 8 ! "Disney"- McDonald's Happy Meal Toys/Complete Set of 8 !. Condition is New. Shipped with USPS Priority Mail Padded Flat Rate Envelope. vintage Lot of 11 Disney Aladdin Happy meal toys from McDonalds dated 1992. Condition is Used. Shipped with USPS Priority Mail. These are actually the Happy meal toys that I bought back in 1992. These are from the movie Aladdin. These are the exact items that you will be purchasing please view pictures. Pictures are description and condition of the toys. By the way genie in the pink jacket with the pink top hat and bow tie I have searched without any results finding him on eBay. So perhaps he is hard to find I do not truly know. McDonalds 1995 Happy Meal Disney Video Masterpiece Collection I, Set of 8 - New. Condition is New. Shipped with USPS First Class Package. I will respond at my first opportunity. I may have it and haven't listed it yet! DISNEY McDONALDS 100 YEARS OF MAGIC GOOFY, 3 7/8" HIGH, EXCELLENT CONDITION,,---. .NO INTERNATIONAL SALES..